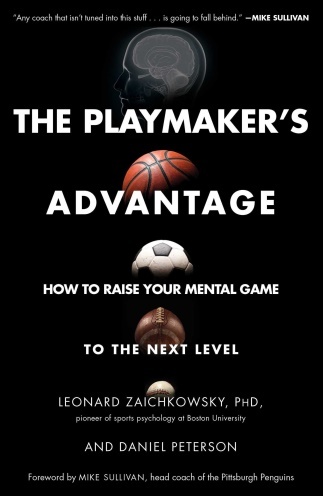 For the Playmaker’s Advantage I wanted to write a book to get across what I think is the most important message in sports right now – that the perceptual-cognitive system needs to be recognised as a pivotal way to train sports performance. Partly this is because cognitive neuroscience over recent decades has started to blossom. But undeniably, technology advancements have also had a major effect, making effective training technologies accessible to coaches and athletes. NeuroTracker is a pertinent example here, along with tools I use for training occlusion and pitch recognition in in baseball and softball. These techniques force athletes to make more accurate decisions by efficiently perceiving what’s actually happening out there. There are a lot of skills that can be conditioned in this domain. Firstly, to able to perceive and draw in more sensory information, for greater situational awareness. Secondly to improve processing speed to be able to act and react more rapidly. Thirdly, to improve decision-making accuracy and response control, for keener ‘game sense’. And fourthly, to be able to execute actions more precisely, efficiently, and avoid critical errors. Collectively these are skills which are all put under enormous pressure in the demands of competition. So every athlete out there, no matter what their level, can benefit by improving them. Just as strength and conditioning took many years to become accepted as a core part of most athletic programs – even though its usefulness had been understood by sports scientists much earlier – cognitive training is now coming to the foreground. I and my co-author Dan Peterson use the term ‘Playmaker’ to symbolize the type of athletes who can perform and execute well under pressure at superior levels. Though many people think athletes like Sydney Crosby, Lionel Messi, Joey Votto, Tom Brady, and Stephen Curry are simply gifted, it’s not necessarily the case. Years of conditioning, along with the right kinds of thinking and experiences, can build up these elite processing and decision-making skills. When we think of the total athlete’s abilities in terms of physical, technical, tactical, and cognitive skill we know athlete performance can be improved through cognitive training. To illustrate, sports writer David Epstein uncovered the role of cognitive systems in endurance, whereby there are brain mechanisms that can actually unlock physical reserves beyond what the physical body can normally do. The trick is not waiting for these abilities to happen almost incidentally, but instead to take a systematic approach to training Playmaker skills with the latest techniques. Most professional coaches know the importance here, but are not usually aware of the best and latest methods for training the thinking system. From my own experience as Director of Sports Science at the Vancouver Canucks, we found that there was almost a one to one correspondence with scores on NeuroTracker and decision-making accuracy on the ice. This really surprised the coaches and scouts. You can imagine just how valuable measures like this can be for identifying upcoming talents. What’s more it can help you understand how to individualize training programs in order to sculpt them to the specific needs of each athlete. My mission is to preach to such coaches to always be looking for ways to train the perceptual-decision making systems of athletes. Going hand in hand with this, the data that comes with this training also delivers valuable profiling data on the cognitive dimension of performance, which is usually hidden. Dan Peterson and I are planning to provide workshops around North America and the globe where coaches and athletes can find out tangible ways to train up critical perceptual-cognitive skills. As a professor, researcher, and consultant, Leonard Zaichkowsky has pioneered sport psychology by bringing cognitive neuroscience and sport performance together as an interdisciplinary science. His books and research publications demonstrate the importance of an athlete’s brain in anticipating and acting on opportunities during competition. He has consulted with teams in the NBA, NHL, NFL, MLB, Australian Rules Football, the Spanish men’s national soccer team, and Olympic sports organizations around the world. If you are interested in finding out more about the perceptual-cognitive approach to cognitive training, then check out Dan Peterson’s and Dr. Zaichkowsky’s website ‘80% Mental’, geared to helping teams develop their Athlete Cognition. You can also read a review of the book by the NeuroTracker team.